Owen (Chris Pratt) meets the vicious T. rex in JURASSIC WORLD: FALLEN KINGDOM. ©Universal Studios / Amblin Entertainment Legendary Pictures. As the fifth film in the “Jurassic Park” franchise, Universal Pictures’ “Jurassic World: Fallen Kingdom” continues to give fans of the hit sci-fi series more of what they’ve come to expect since the original “Jurassic Park” hit theaters in 1993: dazzling dinosaurs and several action-packed scenes that keep viewers on the edge of their seats. But unlike the three somewhat silly sequels that followed the original “Jurassic Park,” director J.A. Bayona’s (“A Monster Calls”) “Jurassic World: Fallen Kingdom” truly goes beyond what fans have come to expect from the blockbuster series as it enters much darker—and surprisingly emotional—territory. “Jurassic World: Fallen Kingdom” has its share of head-scratching moments yet somehow returning “Jurassic World” screenwriters Derek Connolly and Colin Trevorrow get viewers more emotionally invested in the dinosaurs’ plight than ever before. Picking up three years after the Jurassic World theme park was destroyed by dinosaurs out of containment, “Fallen Kingdom” follows the now-closed facility’s park operations manager Claire (Bryce Dallas Howard, “The Help”) and velociraptor whisperer Owen (Chris Pratt, “Guardians of the Galaxy”) back to Isla Nublar on a rescue mission to save the remaining dinosaurs from the island’s once dormant volcano, which has recently roared back to life. With help (or more accurately, money) from Benjamin Lockwood (Academy Award nominee James Cromwell, “Babe”), one of the key figures behind John Hammond’s original Jurassic Park, Claire and Owen set out to assist a team of people assembled by Lockwood’s assistant, Eli Mills (Rafe Spall, “The Big Short”), to capture and relocate as many species of dinos as they can to a new island sanctuary where they can finally live free instead of being treated like they’re at a zoo. Of course, not everyone on the rescue mission has the dinosaurs’ best interests at heart. Soon, Claire and Owen discover that—unbeknownst to Lockwood—the dinosaurs are actually being caught by Eli to be auctioned off on the black market to warmongers to be used as weapons. Additionally, because no one learned anything from Jurassic World’s big bad hybrid dinosaur the Indominus rex, Eli has cooked up a deadly new crossbreed dino of his own that’s part Indominus rex, part velociraptor and considered the ultimate weapon: the Indoraptor. With a variety of dinos now locked up at Lockwood’s Northern California estate, it’s up to Claire and Owen to not only escape from the property with their own lives, but also save the few innocent lives around them—which include Lockwood’s precocious granddaughter, Maisie (newcomer Isabella Sermon), as well as the paleo-veterinarian (Daniella Pineda, “The Originals”) and tech-savvy programmer (Justice Smith, “The Get Down”) they brought along on the Isla Nublar recuse mission—and the endangered animals. However, since they’re not on an island anymore and back in the U.S., releasing the dinosaurs proves to be especially tricky. After all, no one really wants to co-exist alongside of them in a real-life Jurassic World. Easily the strongest “Jurassic Park” installment since the first film, “Fallen Kingdom” not only opens the door to yet another “Jurassic Park” movie (which, for the record, has already been greenlit and scheduled for a 2021 release), but kicks the door wide open. The ending of the film takes the franchise into exciting new territory not only in regard to the dinosaurs’ fate, but also the idea of having the ability to clone other species. The post-credits scene is especially chilling, leaving viewers counting down the days until the sixth film’s release. Although it’s hard to imagine any of the sequels ever topping the thrilling big-screen adaptation of Michael Crichton’s “Jurassic Park,” “Fallen Kingdom” definitely comes the closest. Viewers truly go on a roller coaster ride of emotions, especially during two heart-wrenching scenes where audiences wonder if they’re about to watch the lifelike CGI creatures go extinct. These near-death moments aren’t the only dark points in the film, either; while every “Jurassic Park” movie has characters running for their lives (many of whom audiences hope don’t outrun the dinosaurs), “Fallen Kingdom” is much darker in tone, with the second half of the movie almost playing out like a horror movie with the characters trapped in Lockwood’s manor with the Indoraptor on the loose. The film does have its comedic moments, though, especially in regard to Claire and Owen’s on-again-off-again romance. Audiences can’t help but chuckle at the first shot of Claire, either, which zooms in on the character’s now infamous high heels before panning up (she wisely turns in her heels for a pair of sensible boots when rounding up the dinosaurs on the island, unlike in “Jurassic World” where she was constantly outrunning the dinosaurs in dress shoes). Both Howard and Pratt are fine in their respective parts, although no one goes to the “Jurassic Park” movies for the acting. It would have been nice if the returning Dr. Ian Malcolm (Jeff Goldblum, “Jurassic Park” and “The Lost World: Jurassic Park”) had more screen time, though, than just the brief courtroom scenes at the start and end of the movie. 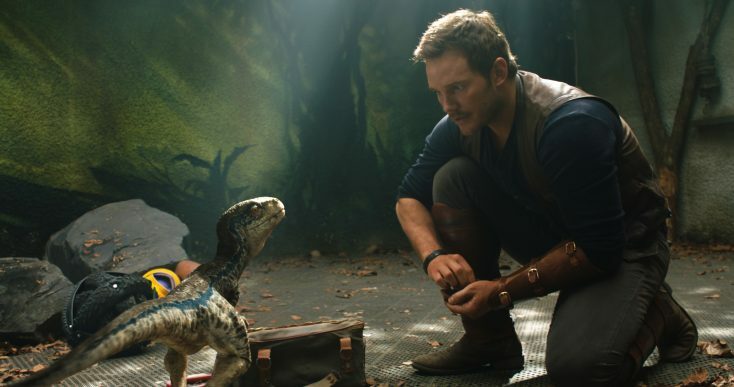 The true star of “Jurassic World: Fallen Kingdom” is Owen’s beloved raptor Blue, who plays a key part in Eli’s nefarious plan. Ultimately, if you were to describe “Jurassic World: Fallen Kingdom” in less than 30 seconds to someone while simultaneously giving away all of its shocking spoilers, it would sound like some cheesy B-movie. But somehow the plot works. The perfect summer blockbuster, “Jurassic World: Fallen Kingdom” may not win any major movie awards, but it’s a blast to watch and breathes some life into a franchise that—five films later—could easily be going extinct.